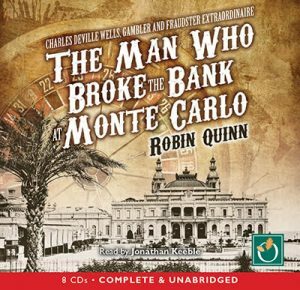 A new audio edition of The Man who Broke the Bank at Monte Carlo has been released by Oakhill Publishing Ltd. This is a complete and unabridged version of the book, with a playing time of around 9 hours 40 minutes. The reader is award-winning actor Jonathan Keeble, who has recorded over 400 audio books and is the voice of the disreputable Owen in long-running radio drama, The Archers.